To celebrate, AirAsia is offering promo fares from as low as P990, all-in, and up for grabs now until December 10, 2017 at www.airasia.com for travel period between January 26, 2018 to January 31, 2019. Clark - Puerto Princesa and Clark – Iloilo routes will operate three times a week or every Tuesday, Thursday, and Saturday while Clark – Tacloban route is every Monday, Wednesday, Friday and Sunday. AirAsia also flies to Davao, Kalibo, and Caticlan from Clark International Airport using Airbus 320s that can accommodate up to 180 passengers. 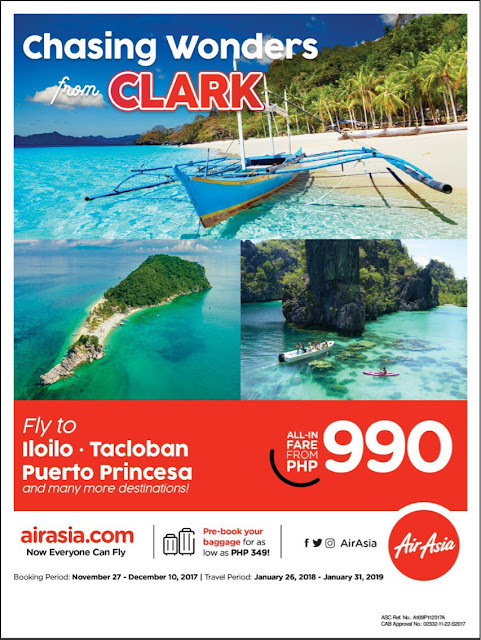 Aside from Clark, AirAsia also offers flights to Iloilo, Tacloban, and Puerto Princesa from the airline’s hub in Manila, Cebu, and Davao. Keep updated with AirAsia’s latest promotion and activities via twitter (@AirAsiaFilipino), Facebook (facebook.com/AirAsiaPH) and on Instagram (@AirAsiaFilipino).